How should I use CCORAL, and how long does it take? When should I use CCORAL? What does CCORAL not do? Why is it important to integrate climate into decision making? CCORAL is a system which helps decision makers to see all kinds of activities through a ‘climate’ or ‘climate change’ lens, and to identify actions that minimise climate related loss, take advantage of opportunities and build climate resilient development in their countries. CCORAL is designed to engender a risk management ethic in decision making. It takes a pragmatic approach, promoting the right tools and techniques to fit the context of Caribbean decision making, available time and resources and uncertainty about climate variability and change. Users are encouraged to prioritise their efforts and use components of CCORAL of most value to them. By using CCORAL, decision makers will also be able to demonstrate to funders, investors and development partners that climate resilience has been considered and integrated into relevant activities. Completing CCORAL does not mean that the conversation is finished. Results from CCORAL should inspire discussion and collaboration between experts and non-experts as you work toward making climate resilient decisions using information collected and resources identified in CCORAL. CCORAL is designed for users of all skill levels, with resources provided for climate experts and non-experts. CCORAL provides different guidance for users depending on their needs and experience. All users must choose their Caribbean country of interest or alternatively the region. It is then possible to access any part of CCORAL. The diagram below illustrates the different components which can be accessed, with an indication of the time required to complete each one and find the tools you need. Use this diagram to decide which component to use first. If you have any doubt, we recommend you start by applying the screening exercise. From here, users are directed to the parts of CCORAL most relevant to them. Detailed instructions will be provided on how each component works. An option will be provided at each stage to save a PDF output of your CCORAL findings. These reports will help communicate results with colleagues, or aid in defining terms of reference/ project scope for the procurement of external technical support. CCORAL can also be used retrospectively, for example to review an approved infrastructure project and assess if the risks driven by climate variability and climate change were adequately addressed and managed in the design, construction and operation of the new assets. CCORAL does not replace existing procedures for making decisions. It is a complementary framework that adds a climate risk dimension to standard decision-making activities in the Caribbean. CCORAL does not offer answers to every question. Rather, it can help you identify which questions to ask and offers a process for how to begin to find answers suited to your activity. CCORAL will not generate a specific climate adaptation response. It provides a structure and resources to help you find the information you need to prepare your own response. CCORAL is a living tool and will be updated as and when new information becomes available. Please revisit this page periodically or before you use CCORAL to find out what’s new. CCORAL is owned by the Member Countries of the Caribbean Community and managed by the Caribbean Community Climate Change Centre (CCCCC). The CCCCC will ensure that CCORAL remains current with risk management tools and is responsive to countries' requirements. CCCCC (2013). CCORAL – the Caribbean Climate Online Risk and Adaptation tooL (CCORAL). CCCCC, Belize. In July 2009, the Liliendaal Declaration on Climate Change and Development was issued by the 13th Meeting of the Conference of Heads of Government of the Caribbean Community (CARICOM). This Declaration provides a vision for transformational change in the region in response to the challenges of a changing climate, and makes a number of commitments, endorsements and specific declarations on the actions needed to affect change. Following from this, and at the request of the CARICOM Heads of State, ‘Climate Change and the Caribbean: A Regional Framework for Achieving Development Resilient to Climate Change (2009-2015)’ (‘the Regional Framework’) was prepared and published in 2009 by the Caribbean Community Climate Change Centre (CCCCC). In order to guide and help operationalise country commitments under the Regional Framework, the Implementation Plan (IP) was developed by the CCCCC and endorsed by the CARICOM Heads of Government in March 2012. Based on a comprehensive period of consultation, 12 priority challenges and actions were identified in the IP to ensure delivery of the Regional Framework. One challenge was the need to develop a risk management ethic in decision making, i.e. to ensure use of risk management processes and tools, manage the uncertainties and integrate climate change into decision making. 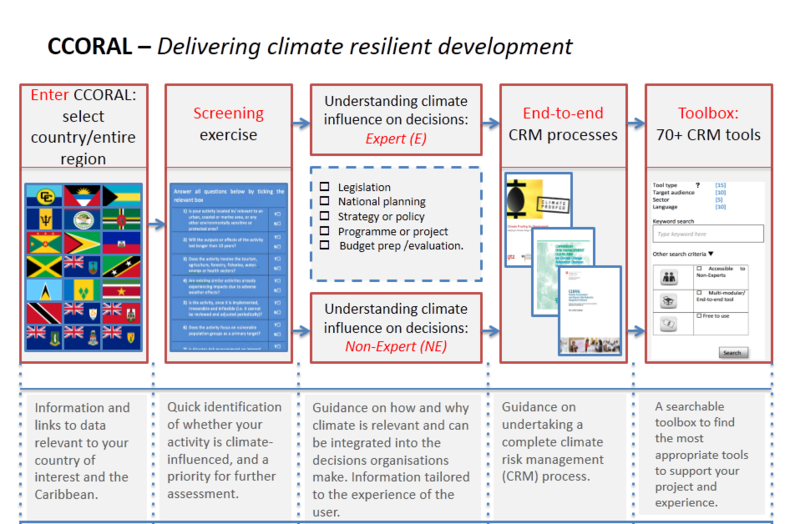 CCORAL has been developed in response to this need following a review of existing climate risk management tools (defined in a synthesis report) and a comprehensive engagement process with target users in the four pilot countries (Suriname, Barbados, Jamaica and Belize). In line with the Regional Framework and IP, CCORAL will support the ‘integration of climate change into national development planning’, and the development of ‘low carbon, climate resilient economies’. This online tool / document is an output from a project managed by the Caribbean Community Climate Change Centre (CCCCC) and funded by the UK Department for International Development (DFID) and the Netherlands Directorate-General for International Cooperation (DGIS) for the benefit of developing countries. However, the views expressed and information contained in it are not necessarily those of or endorsed by DFID, DGIS, CCCCC, CARICOM or CDKN which can accept no responsibility or liability for such views, completeness or accuracy of the information or for any reliance placed on them.